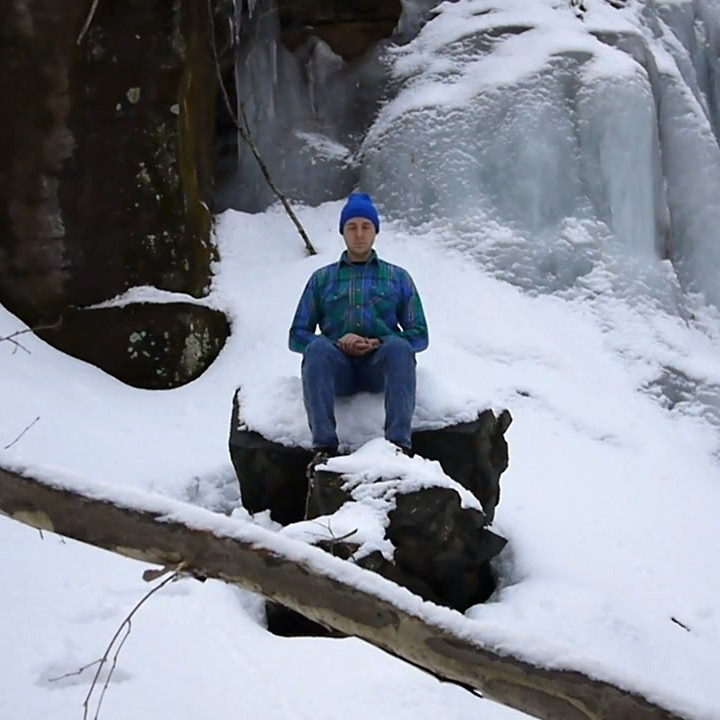 Kev in one of his favorite meditation places, an old rock quarry upstate. Kev Bewersdorf and I had been neighbors for months before we met. When we did, it was because he needed gas for his generator, but I didn't have any. Bewersdorf's work back then had an early William Wegman video art feel; so utterly sincere, but so ludicrous, it was hard to know if he was joking or not. For example, he described the making of his 2008 album as a struggle: "I worked very slowly on these songs, writing them down carefully, coming back to them month after month, living with them for a year or two before sealing them off and uploading them to the web." The album, which featured arrangements of default MIDI tracks with eclectic vocal arrangements, was titled Babes, and it featured a photograph of Bewersdorf lying on the hood of a dented sports car. 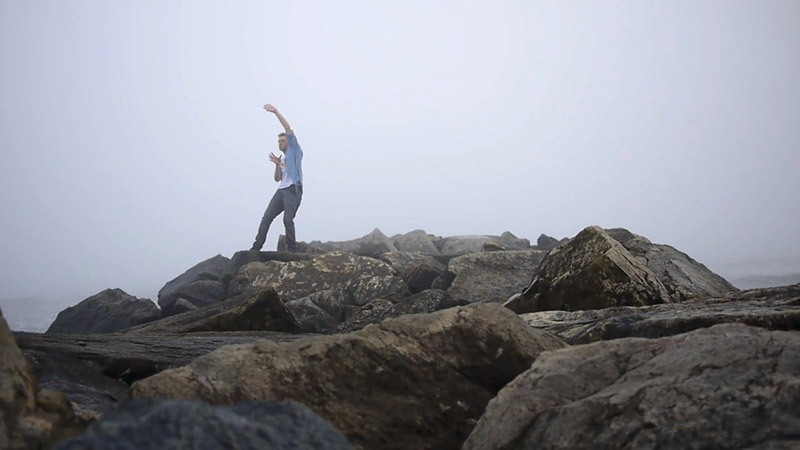 Kev doing his Chi Kung practice in Rockaway. I also got to see his performance PUREKev at the Rhizome benefit at the New Museum in 2009, five years ago last night. He followed two musical acts by delivering a spoken word monologue with accompanying projection and a lit candle on a blue carpet. In the monologue, he seemed to be launching himself as a new product, PUREKev, in terms that mixed the language of marketing with that of new age spiritualism. Delivered with great emotional intensity, it was hard to tell whether the performance was self-help or self-satire; it was funny, but painful too. Cocktail party conversation resumed unabated after the performance, and the energy that he had discharged remained in the air, undigested. A small white flame descended down a field of blue space for a duration of three years. I let the flame make leaps through space whenever I felt a leap in my life. I did not know if the flame was leading me or if I was leading the flame. I did not know how long the flame would fall or if it would ever reach bottom. I just stuck with it, meditating upon the flame. I rarely visited purekev.com on the internet - I tried observing the flame entirely through my internal sense of connection. In the evenings I often observed an actual candle flame. After three years the flame became a white page that remained blank for two additional years. The five year time span of this event was an experiment in treating the technology of the internet with the authentic austerity of a ritual practice. My intention was to slow, cool, and deepen the breath of information. 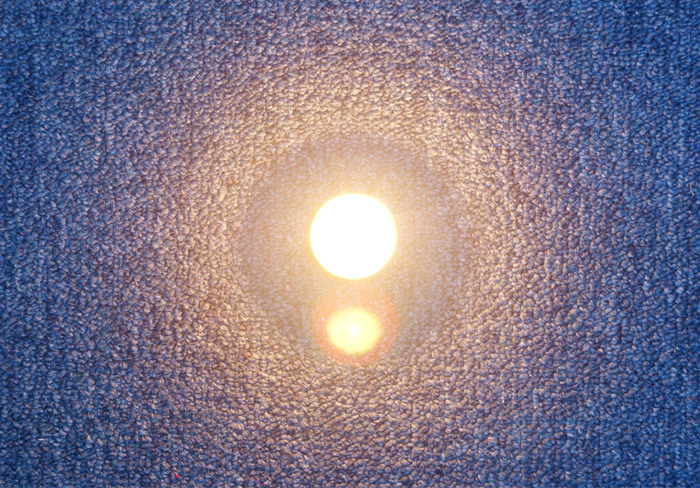 Candle on blue carpet used for Kev's purekev.com meditations. The use of suburban home video imagery in the context of a project that strove for some kind of transcendence was in keeping with much of Kev's work at the time he began the project. Is it scratching at the possibility of spirituality within consumerism, or is it pointing out the emptiness of consumerist spirituality? It's hard to tell which, or maybe it's both. As McHugh aptly observed, Kev's self-removal from the web, though less than total, prompted us to recall his early work through our memories rather than our browsing histories, to think back on the work as we first experienced it rather than rewriting our impressions with each visit to an old website. It also generated a less expected result: Domenico Quaranta's Share Your Sorrow, an experiment in collective archiving to which users could submit Kev's images and works for publication. Both of these outcomes are evidence of the project as an interesting intervention into the normal attention cycles of the web. Before PUREKev, Bewersdorf had often spoken about the fact that the great artists of the time were creating brands, rather than just artworks, and that he, too, was interested in developing his own brand. In keeping with this interest in branding, he initially described PUREKev as "that info which dwells within the product of the Kev." Because of this brand-heavy rhetoric, it's understandable that people might think of Kev's semi-disappearance as a kind of publicity stunt. Kev thinks of it in other terms. I had not thought about it before as a "publicity stunt," at the time I was actually going through a powerful death and rebirth experience, a journey through the underworld. With some comedy to make it less intense. I even took the new name "Kev." It's not incidental exactly that Kev and I met because of surfing—the ocean kind, not the web kind. He was my neighbor in Rockaway, a densely populated sandbar in Queens that is home to New York's only surfing beach and to Kev Bewersdorf. I walked by his house every morning for months to see if there were waves, but we didn't meet until the Saturday after a big flood swept through the neighborhood. I don't really even have a clear visual memory of his old house before several tons of teak collided with it during the surge, knocking off the front porch. I do remember that the old porch was nicer. 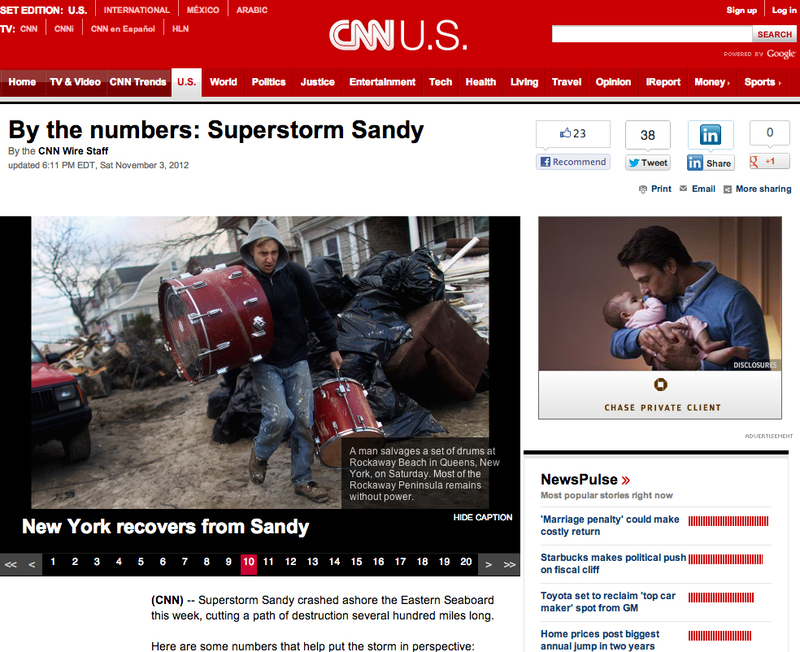 Kev Bewersdorf, the day we met, as seen on CNN.com. About a year and a half has passed since then, and I've gotten to know Kev pretty well. I tried not to grill him too soon or too often about his current work or his internet habits; I was surprised to learn that he has an email address and that he's still involved in Spirit Surfers, and excited to hear that he's writing poetry. Seven months in, he let me read one of the poems. I have been reading the old Chinese poets: Lao Tzu, Chuang Tzu, Han Shan, Tu Fu and some living Chinese poets like Bei Dao. Old Tantric poets like Ramprasad, and living Tantric poets like Dinram. Old Americans - Emerson, living - Gary Snyder. Kev's embrace of Taoism via these writers is thorough. He seems to enact it in daily decisions, from his choice of jobs (including babysitting my daughter and serving homemade Italian ices) to his routine ocean swims to his occasional lengthy disappearances to the woods. I enjoy hearing about the great intent with which Kev makes every decision, from the opening of a browser tab to the planting of a tomato plant, even if sometimes it makes me want to laugh and/or cringe. It serves as an instructive contrast with my own life philosophy, which is derived from my observations of headless chickens. In the context of 21st century America, of course, Taosim is as much an aspect of contemporary culture as it an ancient philosophy, translated and refracted as it is through the Transcendentalists and the 60s counterculture and numerous scholars. Thus, Kev, who has always played the role of the quintessential American, does so even in his seemingly un-American disavowal of the consumer internet. The hybridity of Taoism is what makes it an interesting framework for an act of disavowal. It is the antithesis of contemporary American consumerism, but also a projection of it by way of Walden and Woodstock. Similarly, Kev's practice over the last five years was a refusal of the internet, but also a way of opening himself up to it. After all, he used email, he surfed the web and posted pseudonymously to Spirit Surfers, he released and then deleted an album, he registered domain names, he acted in films, and he even posted secret websites. More importantly, he wrote poetry about the internet (in longhand) and tried to visit his website through his internal sense of connection with it. Thus, Kev was actively engaged with the internet throughout the last five years, especially when he was away from keyboard. Thinking of Kev's life over the last five years as a disavowal of the internet is a digital dualist fallacy. We can and do connect with the internet even when we are not on it. Kev practices a particularly mindful way of connecting. Two days ago, Kev and I spoke on the phone, and he said he was going to share a new work soon. "Even right now I can't imagine that I'm going to post it. I don't know, probably tomorrow in the middle of the night," he said. Last night, he uploaded a new website, ritual.technology, where he has begun to post Taoism-inspired texts and GIFs. For fans of Kevin Bewersdorf, it will seem reassuringly familiar, but also completely different from what came before. "Here is one thing I learned for sure," he says of his five-year experience. "You can't delete your self, but you can transform your self." Kev wants Rhizome readers to know that he works at DiCosmo's Italian Ice on 96th St. in Rockaway Beach, next to Rockaway Taco. He writes, "DiCosmo's has been making all-natural homemade Italian Ice since 1915 (99 Years this year!) DiCosmo's Ice is available to suit the Rhizome reader's Italian Ice needs if they should happen to take a weekend or weekday urban beach vacation to New York's own beautiful Rockaway Beach. This summer, take a frosty dip in the Atlantic and then come see me on 96th St. for your free sample ice!" i saw purekev in toronto. it changed my life. Two years ago I wrote Kev an email asking if he was going to release any new music. Turned out I had just missed the release – and deletion – of his album "Kev" on iTunes. "Deletion expresses shame and sadness of the ancestors" he wrote. He sent me one track via email called "No Memory (Don't Cry)" and I remember how excited I was. It felt like a real treasure just appeared in my inbox, after all I had been longing for new (or even old) Bewersdorf material for years. Amazing how he could make an email mean so much to me. But because of the strong spiritualism of his (seeming) absence on the web I hesitated. I knew this moment was special and so I wanted to be careful and truly focus when listening to the song. I grabbed my AKG headphones, turned off my phone, closed all messaging applications (email, Skype, browser) in order to not get disturbed while listening. I had been deeply impressed by the disappearance of his online persona. His act of deleting all his stuff reminded me of ritual purification – something like the removal of his digital marks and stains on the web. Or some opposite kind of baptism, I don't know. The concept of refusing the biggest benefit of the digital realm – making things accessible, shareable, reproducible, conservable – and deliberately removing a whole body of work from the public just felt crazy and irritating. Especially from the co-founder of spiritsurfers. But it also seemed somehow PURE. I decided to only listen to "No Memory (Don't Cry)" only once and even considered deleting it so I would only own a copy in my memory, waiting for it to wear off and slowly fade away. It seemed only consequent since that's the only way I access his previous work: through my memory. I did only listen once. It's a very beautiful track, probably my fav Kev so far. I thought maybe remembering hearing the best Kev track is as great as it gets, it will be better than the track itself? Last year Marcin Ramocki sent me the link to a new website by Kevin, Treasure Hall of the Misterious Monk: http://www.treasurehallofthemysteriousmonk.com. The site is currently not available, and it's not archived on the Wayback Machine, so it was probably online for a year or less. I hope somebody saved those beautiful animations - if so, please post them on http://shareyoursorrow.tumblr.com/. But I'm pointing to this because it shows a view of the net as a place of impermanence. Enjoy ritual.technology, because it won't last forever. I'm pretty sure everything that was on the Treasure Hall site is also on Spirit Surfers. Kev asked me to remind Rhizome readers and net art pilgrims that they can visit him this summer and buy an Italian ice at DiCosmo's on 96th St. in Rockaway Beach. See the bottom of the post for full updated info! So glad to hear about Kev in any form. I'll never forget our time together in Toronto right after the New Museum appearance. He generously drove himself to Toronto to re-stage the performance with very little incentive except my excitement for him and the urging of our mutual friend Mike Bell Smith. He embraced my lakeside condo habitat as if it was the remote wilderness. He maintained his meditative rituals during the day and at night he slept outside, his stoic silhouette lit only by a river of flickering headlights from a nearby expressway. His performance was brilliant and left an unsuspecting canadian audience in stunned silence. Kev, was my hero, Kev is my hero, long live Kev.